We had a seemingly easy drive planned for today after the swim in Lake St.Clair but I had spotted a “short cut”! Just another minor road preventing the need to go into Hobart and out again. Where the dirt started at either end the following message greets all drivers. This would test how well equipped we were, and we could always turn back if required. 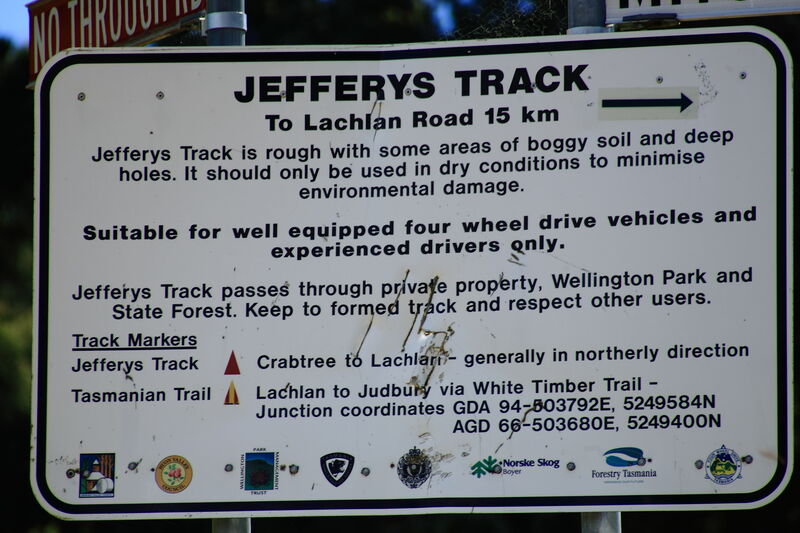 It was only 15km from Lachlan to Crabtree. The challenge was the first hole. The obvious route looked the best but if we couldn’t make it there was no option to winch out. Everyone evacuated the car except me, despite Oscar and Hannah’s requests to remain. The car might have made it but with the camper trailer behind it just fell short so a hasty reverse was required. The only option was a winch assisted one to the right of the track, and fortunately for me with Amanda having seizures up the road, two local lads, Tom and Paddy turned up on dirt bikes offering assistance. Having heard or seen us drive past they had followed for a bit of entertainment I suspect. Apparently they hadn’t been able to get through the previous week due to equipment breakage. With winch attached it took a couple of attempts to get the car through and onto the second hole which by comparison was much easier. The Falken Wild Peaks traction was good and the Pajero performed immaculately. Thanks Tom and Paddy – it would have taken much longer without the local knowledge. From there on in there was an interesting very steep rocky climb, then 10-15 minutes descent down similar. I would have been keen to wait and watch the 4WD coming the other way without winch. Hopefully he turned around. I have been having a good time. I am going to Hobart soon and we are getting a special surprise and it is staying on a farm for two nights. Today we swam in the deepest lake in Australia, Lake St.Clair, also one of the coldest waters to be found. In Boat Harbour it looks like the water is crystal clear. In Burnie we got a special surprise looking for penguins and we found some. I saw the first penguin and it was a chick in its nest. The penguins were little penguins, or fairy penguins. On the Spirit of Tasmania I saw the movie BoxTrolls. The movies were for free. At Trial Harbour we saw my favourite animal. We saw a ……….Tasmanian Devil!!! It was so cute but it was awesome because Tasmanian Devils are endangered and I saw one. Luckily my Mum woke me up to see it. After a quick trip up to Cape Grim, where we saw lots of diary and wind farms, we headed over to the west coast in search of Tasmanian Devils. Xavier’s class has challenged him to see 10 Tassie Devils. In the last 15-20 years this poor animals population has plummeted by over 80% due to the facial cancer that is spread by contact between individuals so this is a particularly hard one. Not ones to give up easily we headed towards the northern end of the Tarkine at Arthur River, the last bastion of the population where the disease hasn’t spread to yet (though it is feared it is only a couple of years away). The Parks and Wildlife rangers in the Arthur-Pieman Conservation Area visitor information centre there were fantastic, with such a detailed knowledge of the area and extraordinary capability and patience with the kids. We got information from where to find burrowing crayfish to how to make craft from kelp as aboriginal women used to do. Cape Grim – What are you looking at? We moved into the camp area recommended to have Tassie Devil sightings. Good news – very few other campers so Amanda promised she would cook up a very meaty dinner, hoping the smell would lure them in. Before that we visited the edge of the world to throw a stone into the water. There is no land to the west between here and South America. 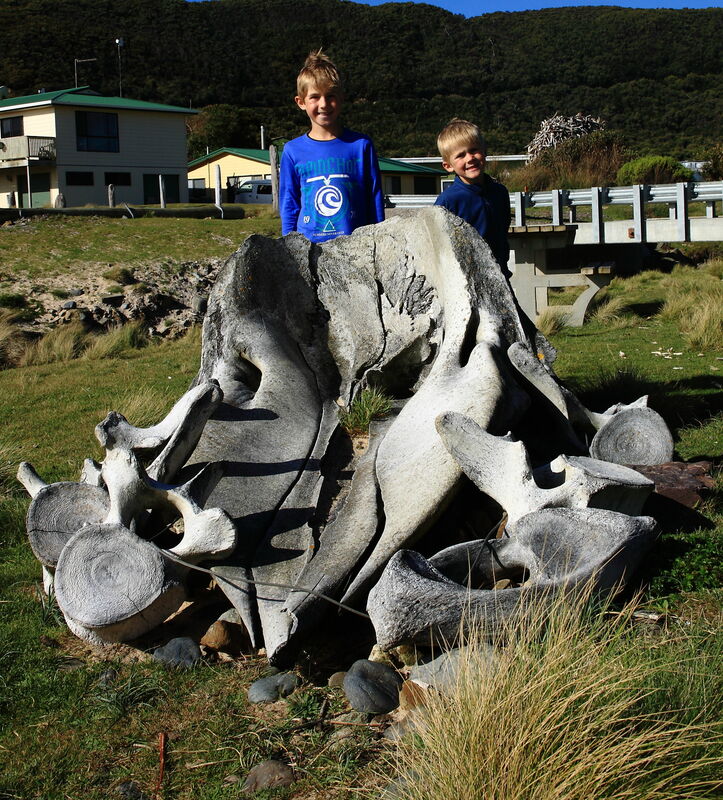 Walking along the beach, where massive tree trunks lie scattered amongst the rocks, Xavier found some footprints in the sand – could they be a Tassie Devils? Make your own mind up but we thought they looked like they could be. As dusk approached, dark shapes appeared on the edges of the campground but these were just the browsing Pademelons moving in on the grass. As daylight failed we pulled out torches and waited, then when we could wait any longer we actively scoured the entire campsite spotting only numerous Pademelon and Tawny Frogmouths. Disheartened we went to bed knowing we still had another day!